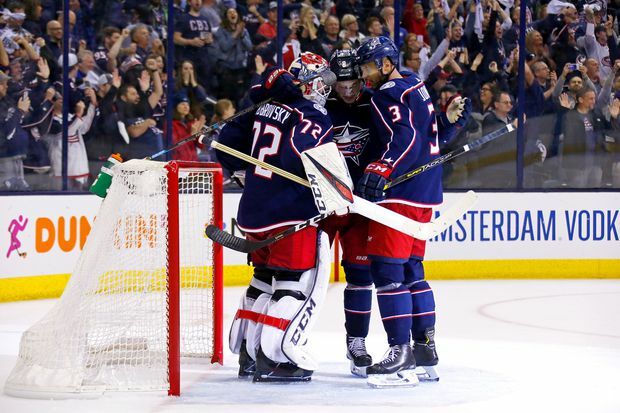 From left: Sergei Bobrovsky, Zach Werenski and Seth Jones of the Columbus Blue Jackets congratulate each other after defeating the Tampa Bay Lightning 3-1 in Game Three of the Eastern Conference First Round during the 2019 NHL Stanley Cup Playoffs on April 14, 2019 at Nationwide Arena in Columbus, Ohio. The Russian goalie shut the door when the Tampa Bay Lightning made a desperate late surge on Sunday night, preserving a 3-1 win and giving Columbus a 3-0 lead in the best-of-seven Eastern Conference quarter-final against the NHL’s best team. The Blue Jackets will try to finish the sweep – and win a playoff series for the first time in franchise history – in Game 4 at home on Tuesday night. Matt Duchene, Oliver Bjorkstrand and Cam Atkinson scored, and Bobrovsky finished with 30 saves, 16 of them in the final period. Without their top scorer, the suspended Nikita Kucherov, and injured defenceman Victor Hedman, the Lightning, who finished with a league-best 62 wins, couldn’t find any momentum until late, and then Bobrovsky rose to the challenge. Columbus has commanded the series since falling behind 3-0 in the opening period of Game 1, only to rally to win that one 4-3. The Blue Jackets pummelled the Lightning 5-1 in Game 2, and solidly outplayed them for most of the game Sunday. The night was satisfying for Bobrovsky – he hasn’t been great in the playoffs the last two seasons – and the Blue Jackets, who were 2-8 at Nationwide Arena in three previous post-season appearances. They are the only NHL team that hasn’t won a playoff series. After a scoreless first period, the Blue Jackets struck 1:44 into the second when Duchene was in the right place to score off a rebound. Bjorkstrand went over Vasilevskiy’s head on a power play for a 2-0 Columbus lead at 8:25, with rookie Alexandre Texier picking up his first NHL assist.